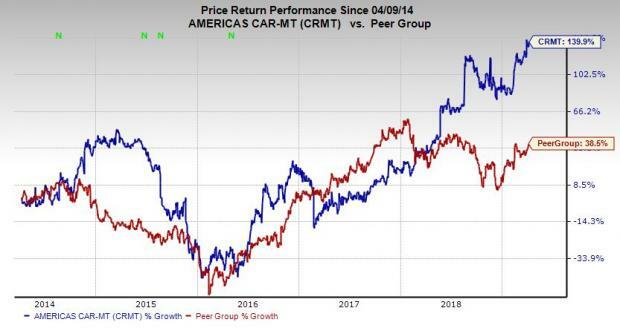 Shares of America’s Car-Mart, Inc. (CRMT) have skyrocketed 83% over the last 12 months to crush the S&P 500’s 10% climb and 2019 has seen the stock hit multiple new 52-week highs. The company operates 144 automotive dealerships in the U.S. and is expected to see strong top and bottom-line expansion in fiscal 2019 and 2020. The company’s growth has helped CRMT stock soar 445% over the last decade to crush the S&P’s 240% expansion and its peer group’s 343% average, which includes the likes of Sonic Automotive Inc (SAH) and Asbury Automotive Group, Inc. (ABG). We can also see that shares of CRMT have easily surpassed its peer group in the last five years, driven by 158% growth in the past 24 months.